We commonly hear such words like Herbal and Ayurvedic these days because of the increasing interest of people in such products. Lots of credit for this awareness in India goes to Baba Ramdev who introduced many Ayurvedic and herbal products in India. His products available under Patanjali brand are very popular in India and millions of people use them. 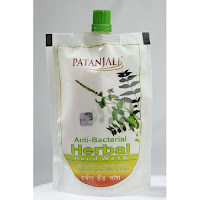 Today, I will review his one such product Patanjali Antibacterial herbal hand wash. The main competition of this product is with hand wash of brands like Dettol and Lifeboy etc. Last month, I decided to give Patanjali Hand Wash a try and bought one pack. In the pack, I found a thick hand wash liquid with a strong smell. To solve this problem, I diluted it with water and it lasted even longer. The price of Patanjali Handwash was Rs 2 more than the other brands which I mostly used; however, the good thing was that it lasted much longer as compared to others. The main anti-bacterial ingredients in Patanjali Handwash are neem and Tulsi each 2mg in each10 ml. It is a foolishness to point doubts on the effectiveness of TULSI AND NEEM, both of them are time tested herbs used from many centuries in India. I am happy that we have a hand wash which contain these natural ingredients. However, pack of Patanjali Handwash doesn't say anything about the other ingredients and their origin. Already, this product has found space in the bathrooms of many Indians and its desi appeal. I rate this product 7.5 out of 10 and I will like to use it again. There are still chances of improvement in this product and I hope that it will become more effective in coming days.